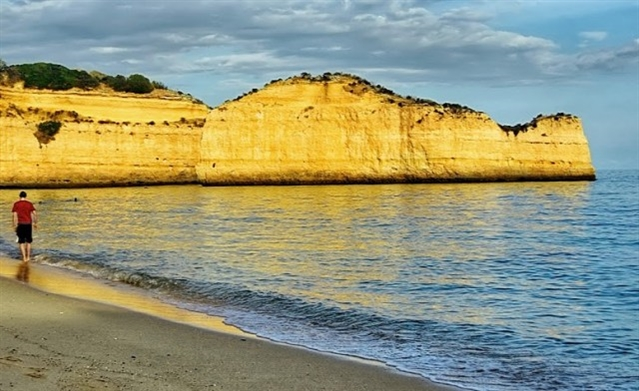 Nestled among cliffs, the sandy beach of Dona Ana bathed by a sea of clear and calm waters is one of the most popular images of the Algarve beaches. The very jagged rocks that emerge from the sea or that scatter the beach provide some shadows to the vacationers and give a picturesque touch to the landscape. 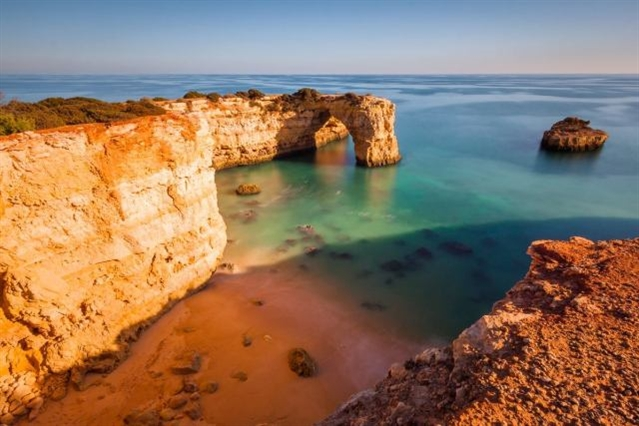 Besides great support infrastructures, Praia de Dona Ana benefits from the proximity of Lagos, one of the most important cities of the Algarve that can be reached in a walk of about 25 minutes on foot. 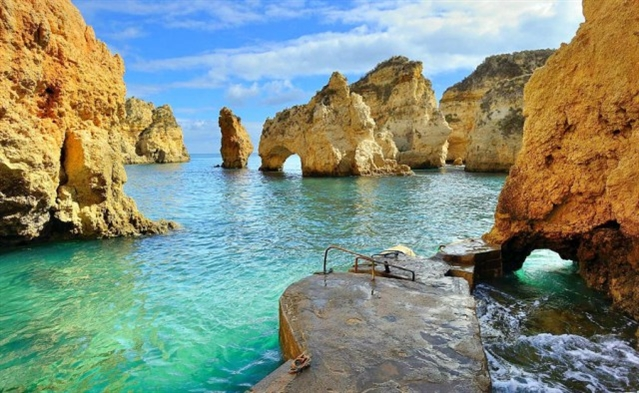 Ponta da Piedade is possibly one of the most beautiful natural scenery of the Algarve coast. The coast is formed by dense corroded cliffs, which have been carved from rocky pillars, natural tunnels and hidden caves. The irregularly deformed sandstone cliffs stand in stark contrast to the peaceful turquoise and green deep waters, and the entire region is simply breathtaking. Considered one of the most beautiful in Europe, Cova Redonda Beach has a small sand that is distributed among rock formations carved by erosion. 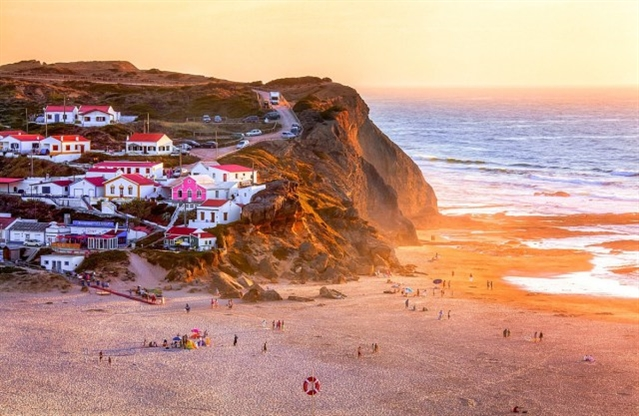 This beach is surrounded by high cliffs and is located east of Praia da Senhora da Rocha, with access as a long, but gentle staircase among lush vegetation. 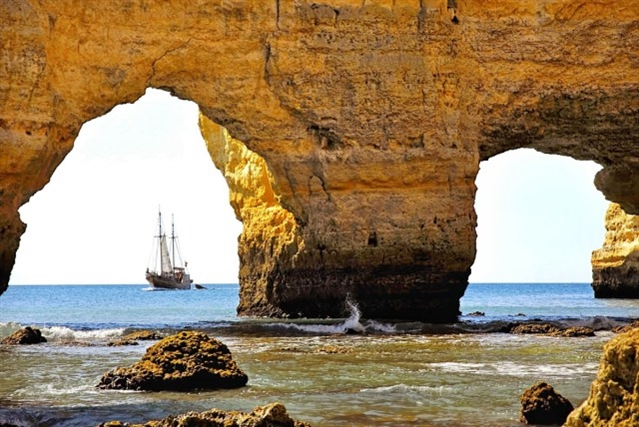 The Cova Redonda beach is appreciated by the high cliffs and rock formations with various shades of orange, so characteristic of the Algarve coast. Preserve of preserved nature, it is a very scenic beach, framed by the cliff sculpted by the erosion of the wind and the sea. It is considered one of the hundred best beaches in the world. Before descending to the beach, dazzle yourself with the landscape that you can see from the top of the cliff that gives you access and then walk down the long staircase. Your effort will be rewarded by the tranquility that you find in this beach, bathed by a gentle sea. Odeceixe has a wide beach cut in half by the Ribeira de Odeceixe. This is a quiet and ideal place for a family holiday due to the existence of tourist and catering facilities. You can enjoy stunning views of the sea from the viewpoint of Ponta Branca. 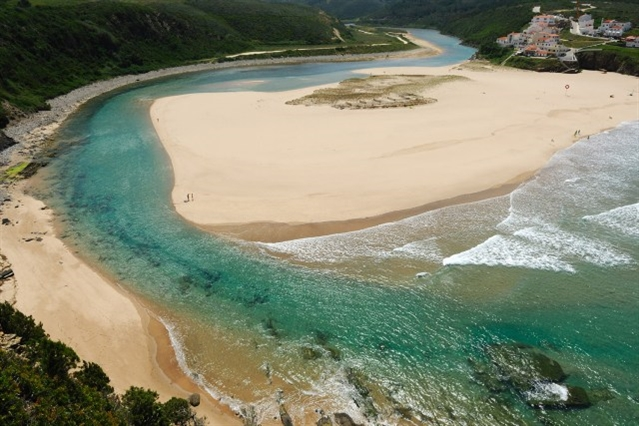 A large and beautiful beach with a large stream around it, Ribeira de Seixe. At low tide you can walk a great dozens of meters on foot; to the south there is a second cove, and another only accessible at low tide, called Praia das Adegas. Excellent conditions for canoeing and boating on the riverside. The charm of this beach of fishermen comes from its small bay of transparent waters. Right in the middle of a very cosmopolitan tourist center. There are boats that can be rented to visit the caves and secluded beaches that abound in its vicinity. The beach of Carvoeiro has maintained its charm and natural beauty, yet still offers all the modern facilities of a cosmopolitan resort. Sheltered by the cliffs on either side and slightly shrouded by the sea, the long sandy beach became a place of choice for families. The colorful boats embellish one end of the beach, being used by local fishermen for fishing or to take visitors on scenic walks through this coastal area. 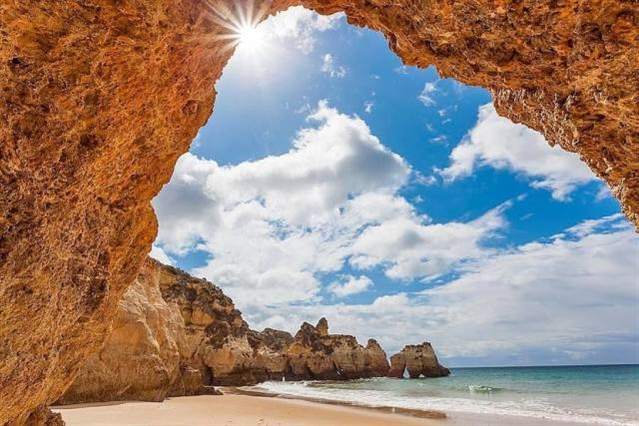 Praia da Albandeira is a beach in the municipality of Lagoa (Algarve), which has a small sandy area divided by a rocky outcrop that creates hollows and shelters that are often used by bathers, as well as beautiful naturais pools. Access to this beach is done in the same way as the beach of Marinha, the Albandeira is also uncrowded, it is almost a secret waiting to be discovered. Although quite secluded this beach has access to restaurants, and a car park. Surrounded by brightly colored slopes, this beach includes small interesting promontories. With its calm and crystalline waters. 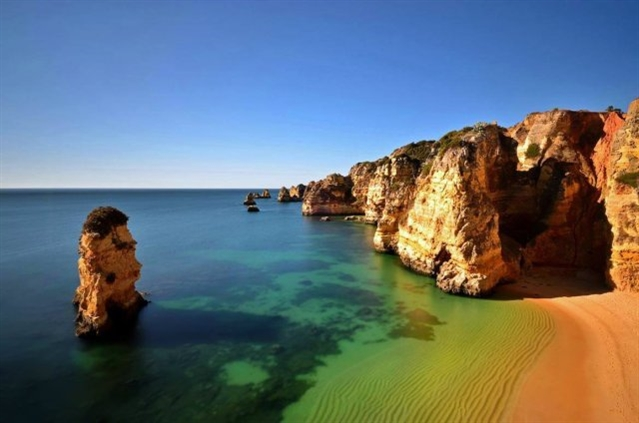 Many believe this to be one of the most desirable beaches in the Algarve such as Batata, Pinhão and Dona Ana beach. Nestled between clustered cliffs, Praia do Camilo has a small beach that is accessed by a staircase with about 200 steps. Before starting the descent enjoy the scenery which is stunning. Três Irmãos Beach is a bay sheltered between rocks, located at the eastern tip of the extensive Alvor beach that extends for about 7 km without interruption. 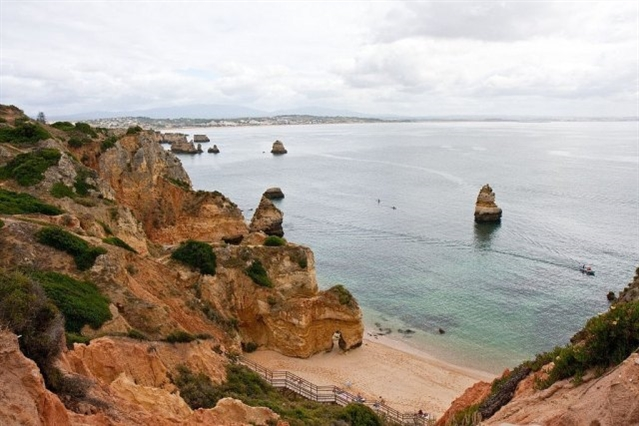 The beach of the 3 brothers is also known as Praia do Alvor West and the beach of the source. It is quite long and exceptionally wide, it has dunes that remain in their places due to the surrounding vegetation. There is a car park, a health center, open during the summer. There are also public bathrooms and restaurants on the beach. Although Monte Clérigo beach has a restful setting, its shallow and rocky inlets allow the observation of several marine species such as octopus, crab, hedgehog or sea bass. In the immediate vicinity of this beach you can find some infrastructures such as a car park, bars and restaurants. There is also a first aid center and a lifeguard lookout during the summer.